Of Red Bay, peacefully at Grey Bruce Health Services Wiarton on Sunday, August 18, 2013 at the age of 71 years. Husband of Carol Ann (nee Murrell). Father of Sherry (Dale Highmore); and Bill Jr.. Grandfather of Amy, Dustin, Patrick and Beth. Brother of Victor (Lois), Marie, Colleen, and Gayle; and brother-in-law of Shirley Thomas, Bruce Mallard (wife Chris), Mary Lou Watson, Bert Murrell, and John Murrell (partner Cindy). Son-in-law of Mary Murrell. Predeceased by his parents Frank and Bessie; sister Olive; granddaughter Cherylene; and his faithful dog Bing. 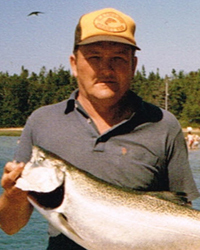 Bill's passions included fishing, boating, hunting and the outdoors. Special thanks to all the volunteer drivers at Home and Community Support Services, and all the staff. All the doctors, nurses, and staff of the Wiarton Hospital; Care Partners and their nurses. To the staff of the Wiarton Post Office; his good friend Bob Sullivan; the nurses and doctors of London Health Sciences Centre. And to Tom and staff of the Thomas C. Whitcroft Funeral Home for their care. Cremation has taken place. At Bill's request, there will be no visitation or funeral service. Donations to BPHS Foundation or Home and Community Support Services (Wiarton) would be appreciated and can be made through the Thomas C. Whitcroft Funeral Home & Chapel, 814 Bruce Rd. 8, Sauble Beach (519) 422-0041.